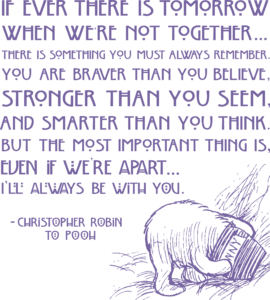 Named for the beloved literary and screen character and “bestest friend” of Winnie the Pooh, the Christopher Robin Giving Society is inspired by his famous quote. In so many ways, these words speak to the enduring legacy of Juliette’s House in the lives of our kids. They are so much more than they may feel when they walk through our doors and we are always here for them, even years after we’ve seen them. Likewise, these could easily be words spoken by our benefactors to Juliette’s House. The Christopher Robin Giving Society celebrates the enduring legacy of those who embrace the vision of our founders and invest in securing the financial future of Juliette’s House and the well being of our community’s children. Membership is extended to all individuals who include Juliette’s House in their estate plans or make a major or a life-income gift.